When NOT to use builds? CKEditor 5 Builds are a set of ready-to-use rich text editors. Every “build” provides a single type of editor with a set of features and a default configuration. They provide convenient solutions that can be installed with no effort and that satisfy the most common editing use cases. 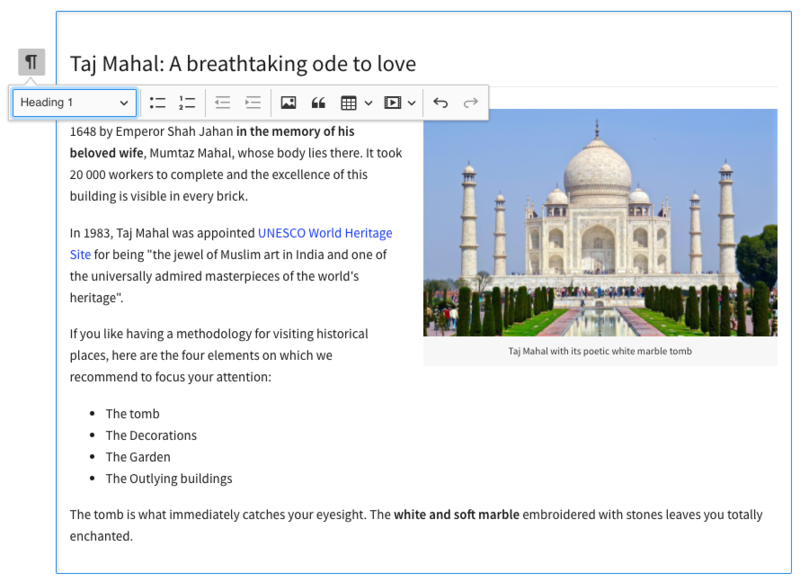 Classic editor is what most users traditionally learnt to associate with a rich text editor — a toolbar with an editing area placed in a specific position on the page, usually as a part of a form that you use to submit some content to the server. During its initialization the editor hides the used editable element on the page and renders “instead” of it. This is why it is usually used to replace <textarea> elements. The toolbar is now always visible when the user scrolls the page down. The editor content is now placed inline in the page (without the surrounding <iframe> element) — it is now much easier to style it. By default the editor now grows automatically with the content. To try it out online, check the classic editor example. Jump to Quick start to start using it. Inline editor comes with a floating toolbar that becomes visible when the editor is focused (e.g. by clicking it). Unlike classic editor, inline editor does not render instead of the given element, it simply makes it editable. As a consequence the styles of the edited content will be exactly the same before and after the editor is created. A common scenario for using inline editor is offering users the possibility to edit content in its real location on a web page instead of doing it in a separate administration section. To try it out online, check the inline editor example. Jump to Quick start to start using it. To try it out online, check the balloon editor example. Jump to Quick start to start using it. 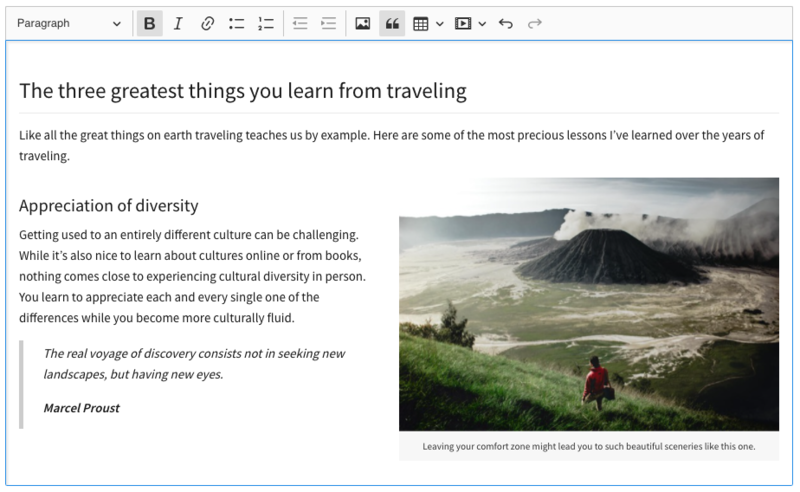 Balloon block is essentially the balloon editor with an extra block toolbar which can be accessed using the button attached to the editable content area and following the selection in the document. 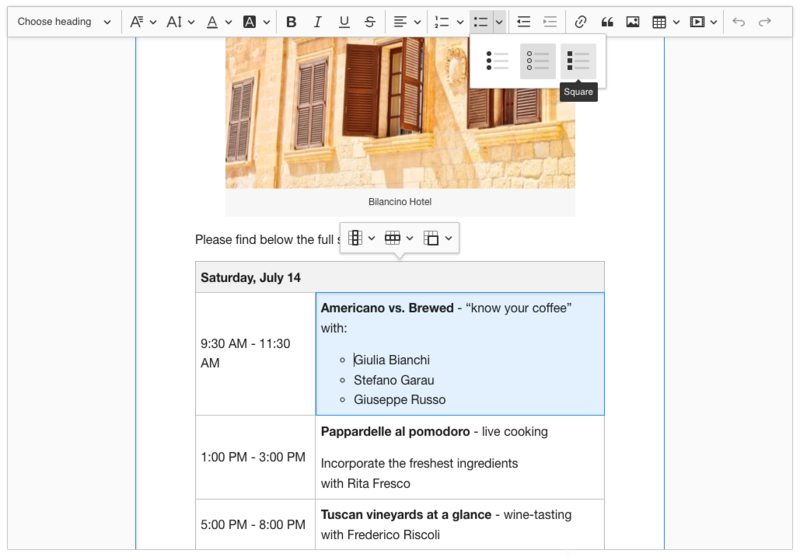 The toolbar gives an access to additional, block–level editing features. To try it out online, check the balloon block editor example. Jump to Quick start to start using it. 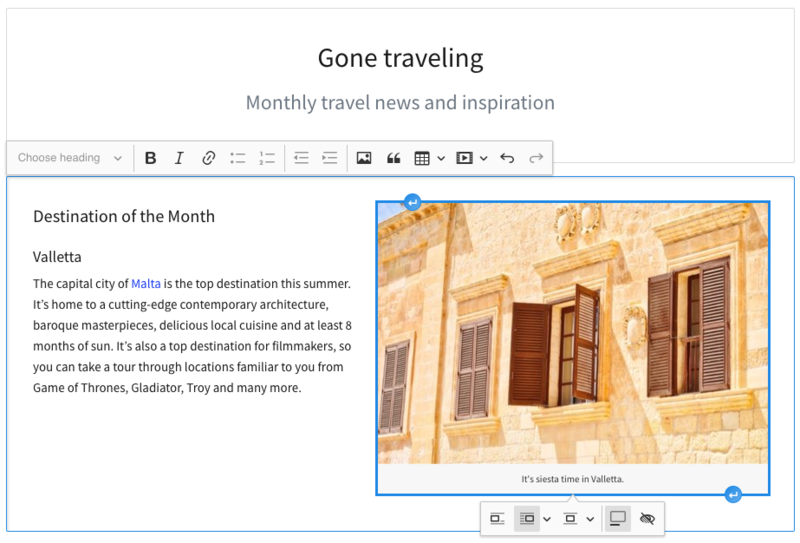 The document editor is focused on rich text editing experience similar to the native word processors. It works best for creating documents which are usually later printed or exported to PDF files. 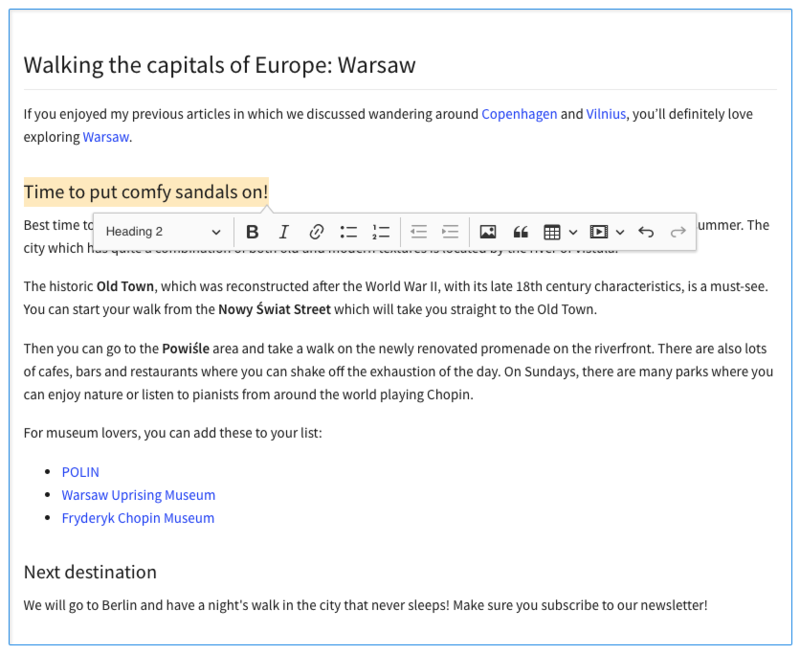 To try it out online, check the document editor example. Jump to Quick start to start using it. You can override the default configuration of features (e.g. define different image styles or heading levels). You can change the default toolbar configuration (e.g. remove undo/redo buttons). You can also remove features (plugins). Read more in the Configuration guide. If a build does not provide all the necessary features or you want to create a highly optimized build of the editor which will contain only the features that you require, you need to customize the build or create a brand new one. Check Custom builds for details on how to change the default builds to match your preferences. Include the set of features proposed by the Editor Recommendations project. Include features that contribute to creating quality content. Provide setups as generic as possible, based on research and community feedback. Each of the builds fits several different use cases. Just think about any possible use for writing rich text in applications. Forms for writing articles or website content. Inline writing in a frontend-like editing page. Creating topics and their replies. Social messaging and content sharing. Creation of ads in recruitment software. # When NOT to use builds? When you want to create your own text editor and have full control over its every aspect, from UI to features. When the solution proposed by the builds does not fit your specific use case. When compatibility with old browsers is a requirement. If CKEditor 4 contains features that are essential for you, which are not available in CKEditor 5 yet. If CKEditor 4 is already in use in your application and you are still not ready to replace it with CKEditor 5. Inline comments and discussion in the content.